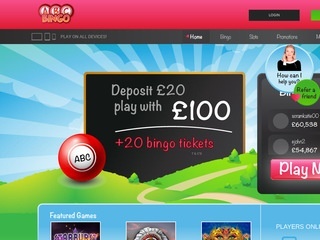 ABC Bingo Casino will then reward you with a bonus (Welcome Bonus is for new players only). The terms and conditions of the bonuses vary between different casinos and might also change over time and between different countries, so it is important to compare the different offers and read the T&C for ABC Bingo Casino before signing up. Recalling the familiar nursery rhyme and your first ABCs, ABC Bingo Casino is the place to relax and feel at home. Your host is Vicky and she will guide you through the venue. She is also available on all pages, so there is no way you will ever get lost. Vicky introduces you to the magical world of bingo and casino playing shows you the ways to win more and lets you relax and enjoy yourself to the fullest. ABC Bingo Casino prides itself on having two licenses – from the UK Gambling Commission and the jurisdiction of Gibraltar. Having these two names vouching for trustworthiness and reliability of your online casino is a great honor that not any online casino can boast. On the other hand, there is a great number of restricted countries for ABC Bingo Casino. The residents of the following countries are currently not able to enjoy playing at this gambling destination: the United States and territories, France and all of its territories, Germany, Belgium, Denmark, Gibraltar, Italy, Spain, Antigua and Barbuda, Turkey and Israel. Vicky’s abode is home to a plethora of diverse games that do not only include fantastic Bingo editions, but also a wide selection of popular casino games – slots and card games. In our opinion, it does more than a great job catering for the diversity of titles that you can play on all devices possible – desktop, smartphone or tablet. The casino is compatible with all operating systems, so regardless if you are an iOS fan, and an Android user or a Windows enthusiast, you can enjoy ABC Bingo Casino anytime, anywhere. At the beginning, the portfolio was fully powered by the one and only Dragonfish platform, which guaranteed quality, top notch games. In the meantime, IGT and NetEnt have climbed on board, and we can expect more suppliers to come in the future. As we have stated already, when an online casino boasts an offering form such a big name in the slot circles such as NetEnt, we know they are playing no games. Each month, you will get a warm recommendation of best games to play from Vicky, and in November 2018 she says the one for you is Starburst. Other featured games include Shaman’s Dream and Cleopatra. The rest of the slots is a decent selection of games such as Irish Luck, Da Vinci’s Diamonds, Golden Goddess, the branded Guns ‘N’ Roses slot, The Jewel Thief and Lost Island, as well as a progressive jackpot in the form of Mega Fortune Jackpot. ABC Bingo Casino has grown significantly in the previous months. Following its progress, we can tell it has enriched its repertoire of games, and now features an ample selection of table games as well, which was not the case a few months ago. Among new titles, all of you lovers of table games will be able to find Baccarat, Blackjack and variant Sidebet Blackjack, as well as a bunch of modernized Roulette editions such as American Roulette, European Roulette and French Roulette, with both high and low limits, and in both single- and multi-hand modes. A decent collection of video pokers is found in the form of Deuces Wild. The online casino seems to have taken efforts to grow its card game portfolio, so we are expecting new video pokers in the next couple of months. Since you are there already, why not pay a visit to ABC Bingo’s exclusive Bingo lounge. The place features numerous thematic rooms with games played in real time for more authenticity, and Bingo itself is found in many of its variants. Here you can play the likes of Bingo 90 Ball, Bingo 75 Ball and Bingo 5 Line, the latest of which is another monthly fan favorite. We have not been able to find any live casino games at ABC Bingo Casino. However, the venue does offer many other titles to choose from, so for the time being, that should do. Banking at ABC Bingo Casino is as easy as A, B, C! The online gambling venue accepts all major payment methods that will suit the needs of most players. While bank wire transfers are currently an option for withdrawals only, you can go for ewallets and credit and debit cards for transferring cash both back and forth. Your options are as follows: Neteller, PayPal, Paysafe Card and Entropay for the former, and Visa, Visa Debit, Visa Electron, Maestro and MasterCard for the latter. The payout time typically last up to 72 hours in total, which is in accordance with the industry’s standards. 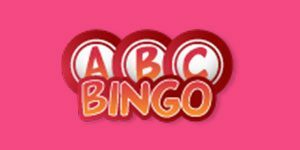 The least you can withdraw at ABC Bingo Casino is £20, and you can get paid out up to £3,000 each month. In times of need you can easily get in touch with the helpful customer service team either via Live Chat or phone.